On the first day of Christmas, we were so sick with a cold and cough that all we could manage was opening our gifts and sitting by the fire. 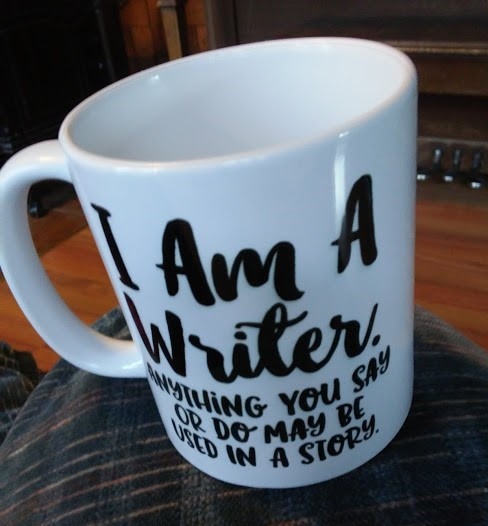 Got this nifty mug – someone knows me well! 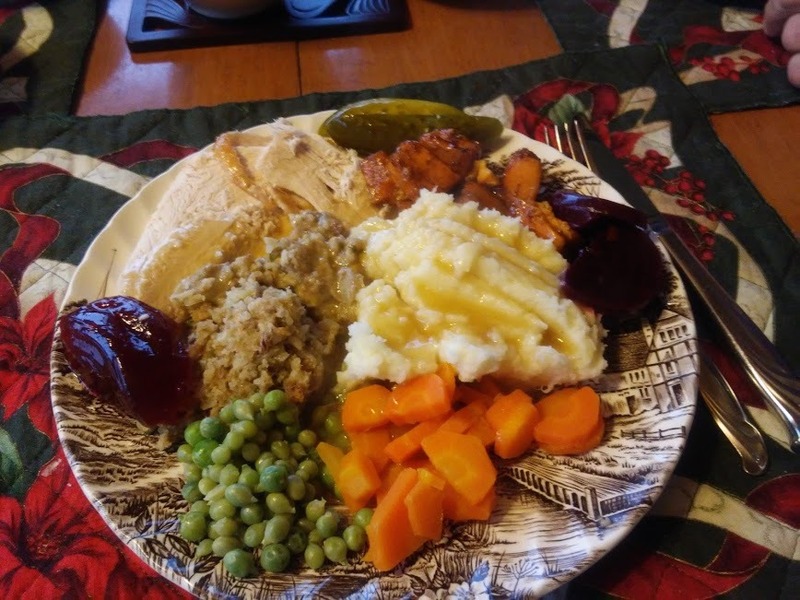 On the second day of Christmas we recovered enough to cook our turkey. Yummy. 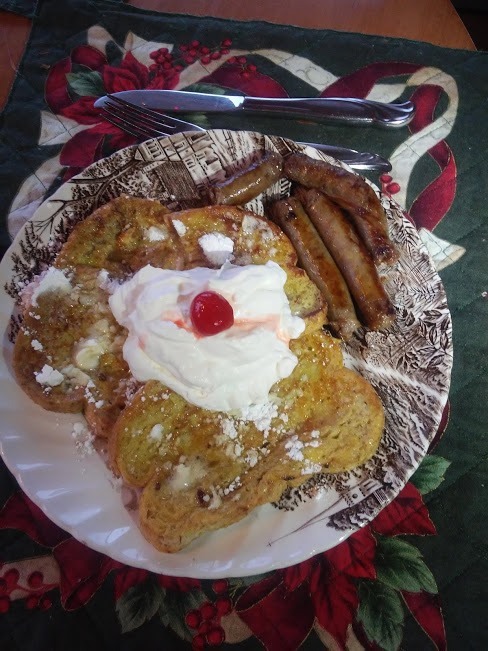 Third day of Christmas was greeted by a holiday breakfast – sausages and French toast with icing sugar and whipped cream. We’re getting into the swing of holiday food. 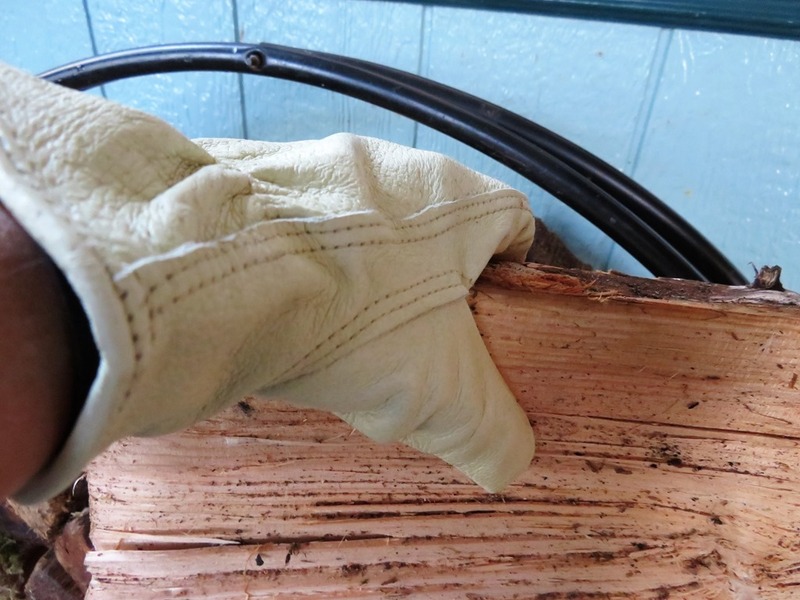 On the fourth day of Christmas, I used my brand new gloves to load the stove. 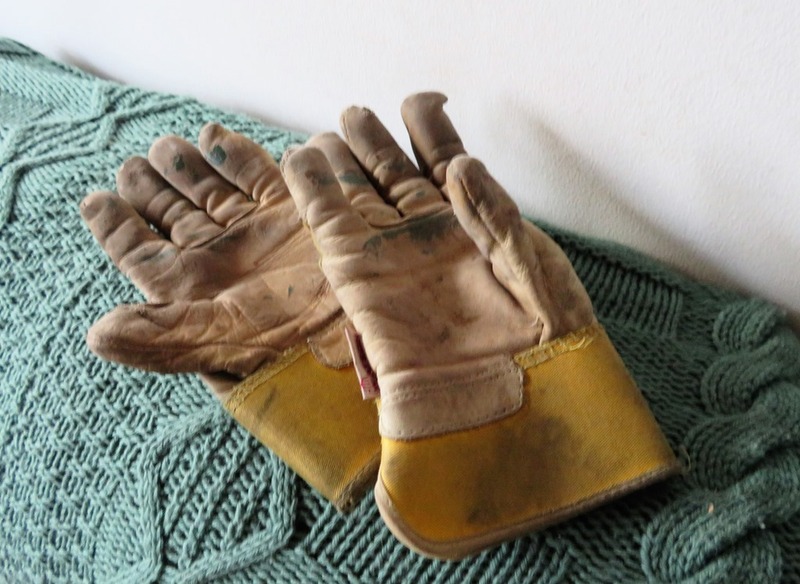 Gotta keep those home fires burning and as you can see from the first glove photo, I was due for a new pair. Making the coffee on the morning of the fifth day of Christmas, I stare out the kitchen window and wonder what this garden gargoyle is planning. Got busy on the sixth day of Christmas clearing out and shredding a bunch of paperwork from the settling of my dad’s estate. He died seven years ago, so it was time. Came across this photo. 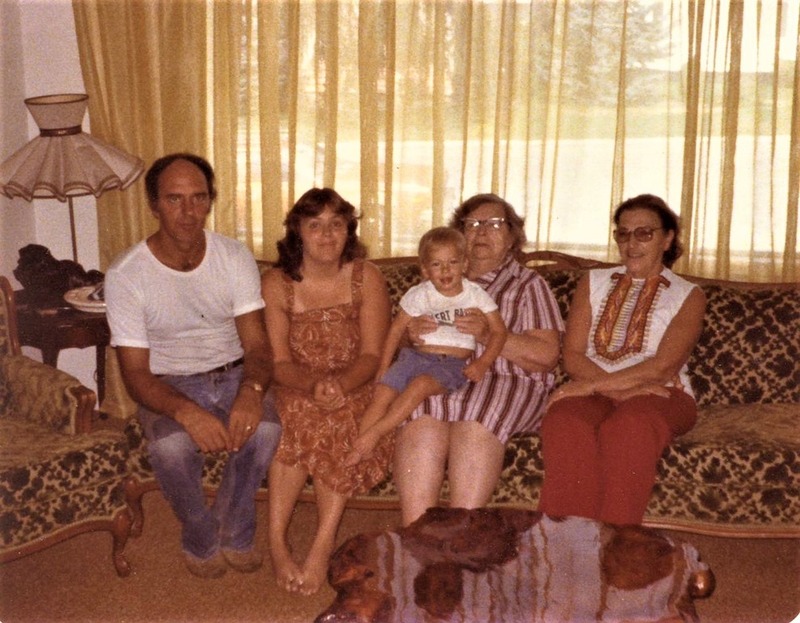 Five generations – me at barely twenty-one with my son Doug, my dad, his mom and her mom. Wow! The time really does fly. 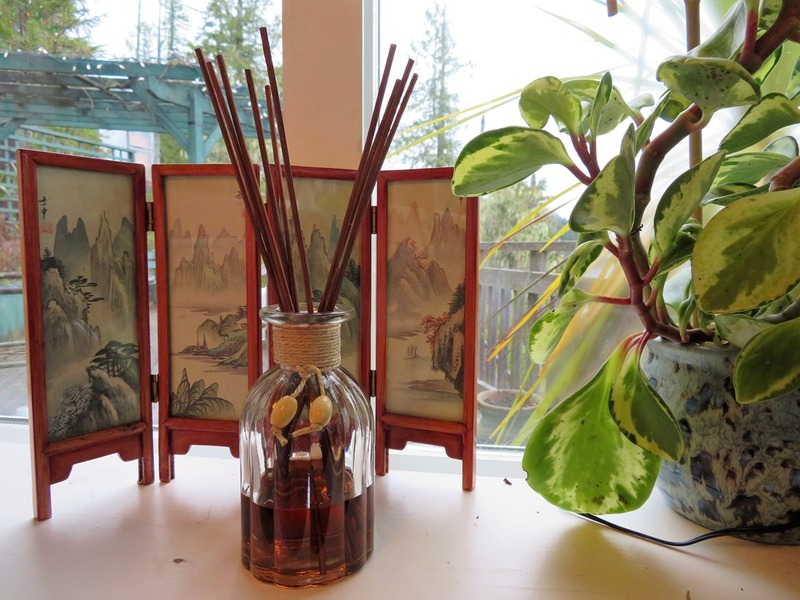 The seventh day of Christmas saw me setting up my new Cinnamon-Sugar diffusor. My desk now smells like cookies all the time. Talk about inspiration. The eighth day of Christmas and the first day of 2018. 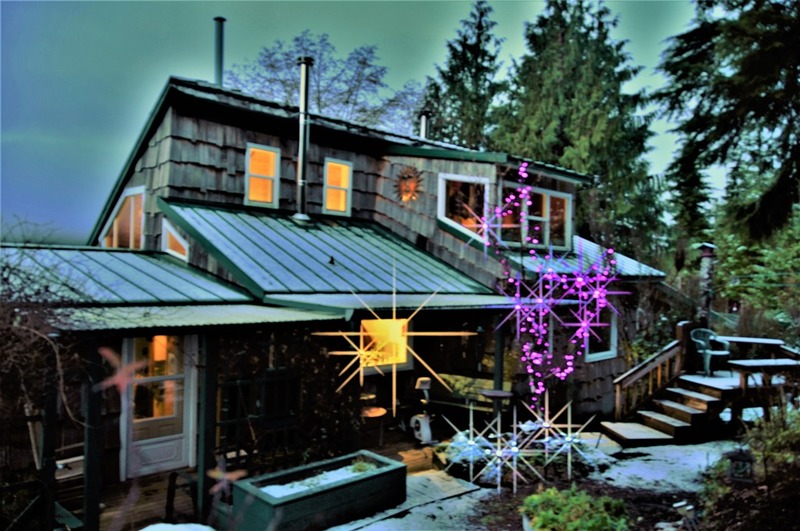 Happy New Year from our home to yours. 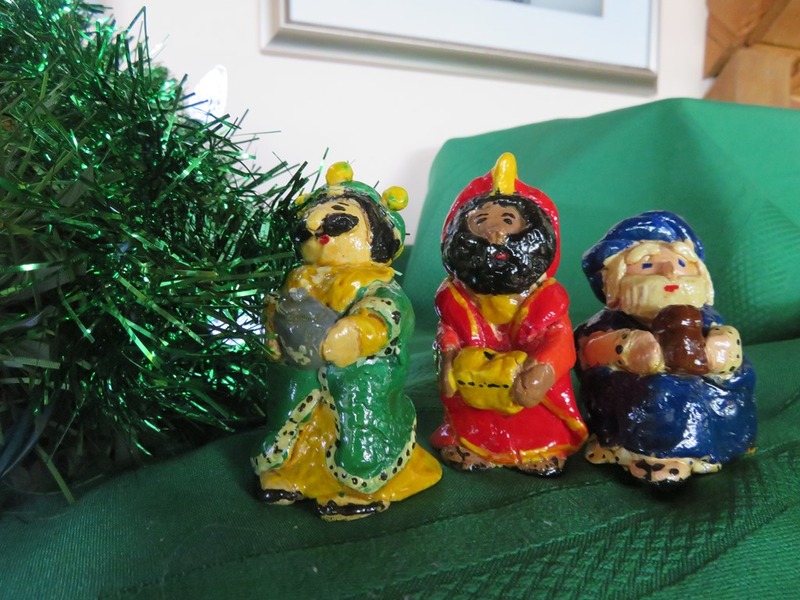 On the ninth day of Christmas our little Wise Men approach closer to the stable. 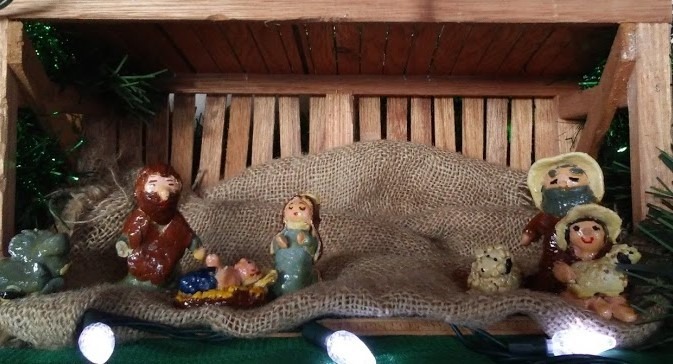 My mom made this dough-art nativity set for me way back when my kids were little. My mother was a very crafty type of person and she was constantly creating things and giving them away. Some I received with politeness and others with great joy. The nativity set was and continues to be the latter. Over the years, baby Jesus’ hands have been broken off and the donkey lost an ear but none of that seems to matter. 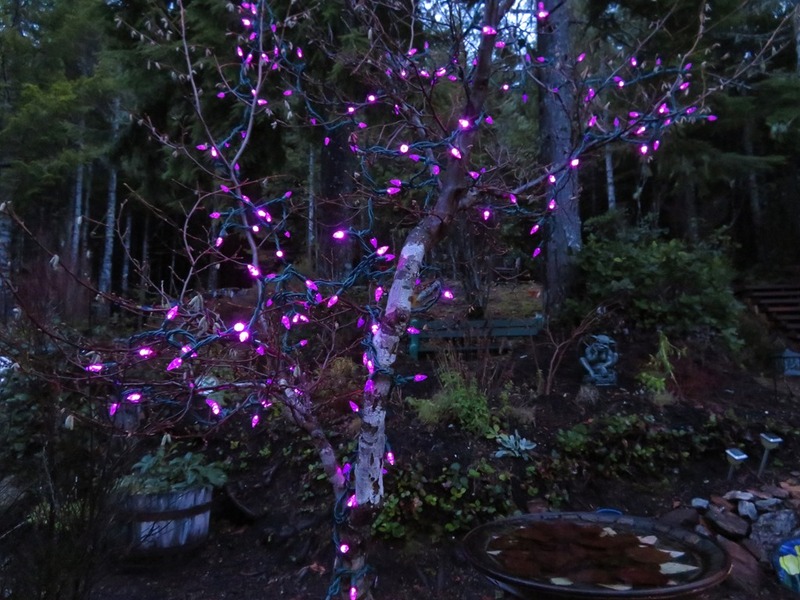 I am inspired by my mother’s giving, creative, go-for-it spirit. Who else would have created a nativity set from dough-art? 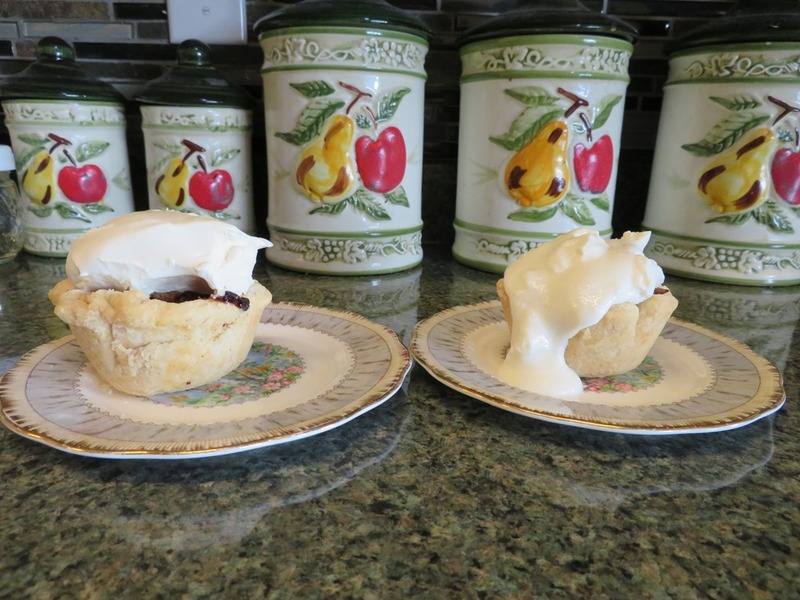 The tenth day of Christmas sees us enjoying green tomato mincemeat tarts. I made and froze this mincemeat in September with thoughts of New Year treats. On the eleventh day of Christmas I am taking some time to reacquaint myself with an ongoing project of knitting up all my scraps of yarn. 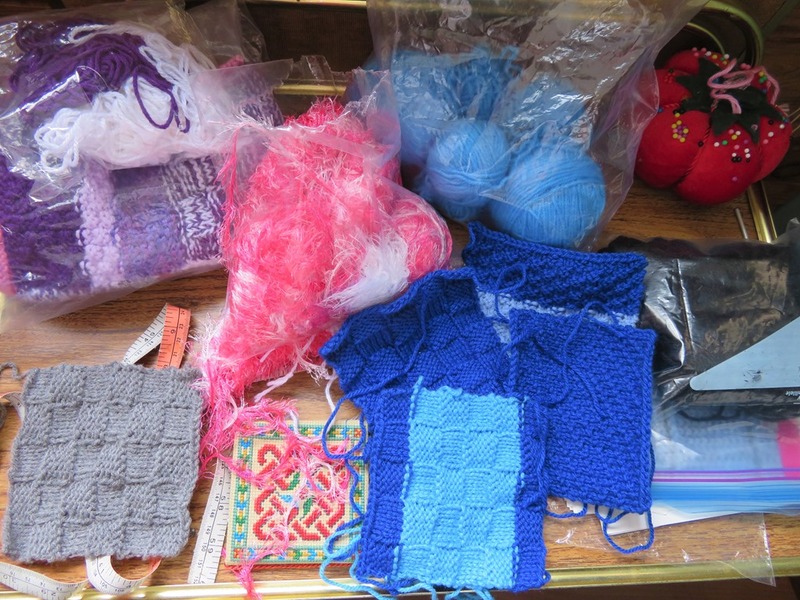 What I’ll do with all the squares when I’ve emptied the craft bin, I have yet to decide. Well, the twelfth day of Christmas is upon us. We’re saying goodbye to the season. Sorry to see the end of decorations, lights, cards, gifts and yummy food. But it’s time to move on with 2018. Here’s hoping that all of you have had a joy-filled holiday. Best of everything for the new year. 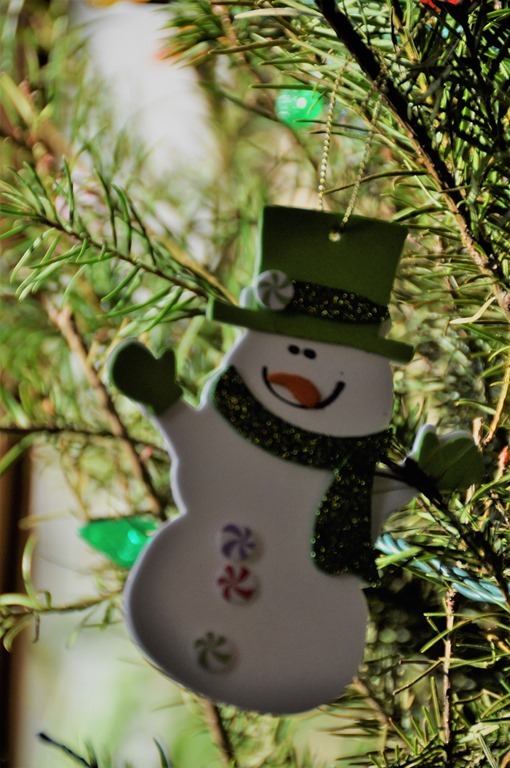 This entry was posted in Current Events, Life, Photography and tagged epiphany, holiday celebrations, holidays, New Year. Thanks! Wonderful times and now on with 2018.